Audio systems are in most cases the kind of technology that is best suited for renting. The fact is that most events do not occur often enough to justify the purchase of an entire audio system, whereas events that utilize them the most, such as conferences, conventions, or trade shows usually occur annually. For these kinds of events, renting audio systems is the ideal solution for such a temporary need. Tech Travel Agents are here to make your next audio speaker rental a cost effective and simple process. We deliver nationally to thousands of businesses across the country. We take the time and effort into customizing each rental order to fit the specific users needs. When choosing your next audio speaker rental make sure to take into consideration which speaker rental is right for you. The two main factors that you need to focus on is how big your audience will be and what type of specific equipment you need? We can customize a sound system to work with multiple audio devices simultaneously, including iPods, DVD players, laptops, and microphones. This sound system can also output to a recording device. *Speaker stands are also available, please specify in your quote request. This package is ideal for speaking to groups of approximately 50 people. Common uses include conference rooms, breakout sessions, rehearsal dinners, training, and presentations. This package is ideal for speaking to groups of approximately 50-200 people. Common uses include medium sized venues like hotels, banquet halls and large conference rooms. This package is ideal for music, film or speaking to groups of approximately 200+ people. Common uses include conventions, weddings, small concerts, and political campaigns. This package is ideal for a single audio source for groups of approximately 50 people. Common uses include hook up to a single audio source like a Laptop, MP3 player, iPod or smart phone for small parties. 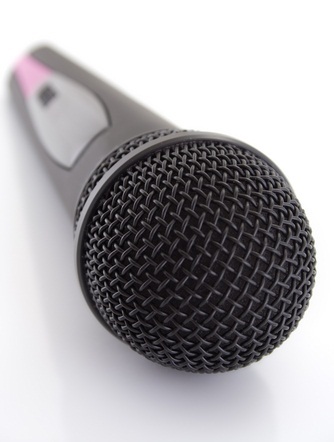 This package is ideal for voice, music, or film for groups of approximately 50-200 people. Common uses include connecting to three simultaneous audio devices for conventions, weddings, small concerts and political campaigns. 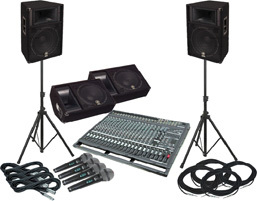 This package is ideal for larger events with music amplification for groups of approximately 200+ people. Common uses include connecting to several audio sources for concerts, large conventions and product launching. These sound system rental packages sound much different outdoors than indoors. If your event is outside then you may need a system with larger wattage speakers. For instance, if your outdoor event has 150 people, you probably want a package designed for 200+ people due to the fact that outside accoustics are minimal. Additionally, its important to remember that outdoor events dont always offer reliable power sources. In these cases, we offer battery powered PA system rental packages. This package is ideal for outdoor events for groups of approximately 100 people. Speakers last up to 5 hours when fully charged. Common uses include press conferences and corporate events.